The Good: Very high mpg, very quiet ride, comfortable front seats, and good handling. The Bad: Unless you already own a hybrid, you may find the dashboard displays confusing. After years of waiting the Chevy Volt is finally available to the buying public. The question is, will the public buy it? There is no doubt the Volt is a good car, but is it worth roughly 20 thousand dollars more than its platform mate, the non-hybrid Chevy Cruze? The first thing you’ll notice when you drive the Volt is the almost eerie quiet. At low speeds the car simply doesn’t seem to make any noise. When you get above 25 mph you’ll start to hear some tire noise, but you won’t hear any engine noise and that’s because an electric motor moves the Volt. Even the quietest cars have some engine noise, but seemly not the Volt. Combine the quiet motor with an open road and you’ll be breaking the speed limit in no time. When I drove the Volt on the highway I was going close to 80 before I knew it because, even though I watched the speedometer, there was an unconscious part of me that tried to judge the speed of the Volt based on engine noise and the Volt just didn’t make enough. 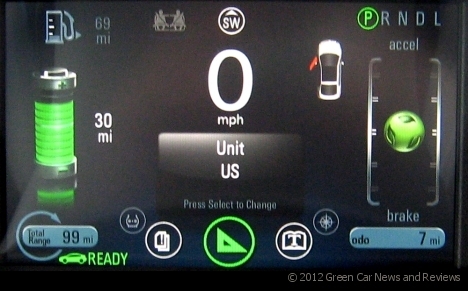 Once you get over how quiet the Volt is you may notice it’s instrument display. It must be because the car is so unique that the designers at Chevy felt the dashboard had to be also. There is good and bad to this. The display gives you some useful information, such as an estimate of how many miles you can go based on your battery charge and how many miles you can drive based on the gas in your tank, but after that it goes overboard. One question I had was what is the Volt, an electric car or a hybrid? The folks at Chevy like to refer to the Volt as an electric vehicle with a range extending gas engine. Purists will note that the Volt can be directly powered by the gas engine so it shouldn’t be considered an electric car, but the reality is it is almost always powered by the electric motor. Anyone that has every owned a car in the Midwest knows that when the temperature falls below zero starting your car can be an iffy proposition. This is because car batteries don’t deliver as much power when they are cold. One of the marvels of the Volt is the battery pack which will take you about 35 miles on a full charge. The battery pack is designed to maintain its power in very hot or very cold weather. It does this by having what is, in essence, its own heating/cooling system. When the weather is cold the system keeps the battery warm by heating fluid that surrounds the battery pack, when the weather is above 90 the fluid is used to cool the battery. In theory as long as the battery is kept at an optimal temperature you will always have that 35 mile range. This is significant as most hybrid/electric cars don’t utilize this technology and therefore in the winter their miles per gallon can drop dramatically until the battery pack warms to its optimal operating temperature. Yes, the Volt handles well, rides well, has comfortable front seats and is very quiet but once you get past these undeniable charms you might start thinking, does this car make sense for me? Is it a good value? And therein lies the problem for Chevrolet. 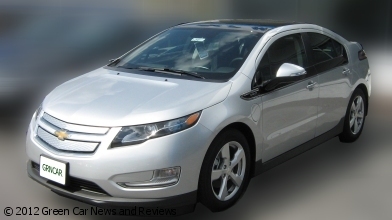 As good as the Volt is, is it worth over $40,000? The Volt shares some of its platform with the Chevy Cruze (which is a big seller for Chevy) and has many noticeable similarities. The Volt and the Cruze have about the same amount of interior space, are approximately the same length, width and height, and they both handle well and have excellent brakes. The Cruze isn’t as quiet as the Volt and it uses only gas, but the $20,000 you save if you buy a Cruze will pay for a lot of gas. And for the record, the Volt requires Premium, the Cruze is fine with unleaded. Of course, as long as you are using the battery, you don’t need gas. Or at least not very much. You will always have to put some in because every month the car forces the gas engine to run in order to stay in working order. Now, for the sake of argument, let’s say you purchase a Volt and drive it about 25-30 miles each day and then charge it every night. Assuming a national average of 12 cents per kilowatt hour (and in fact many utilities charge less, and some charge still less during off-peak hours) your utility bill could increase about $1.25 per day (assuming slightly less than a full charge each night). 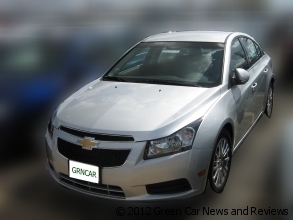 Therefore the Volt will cost about $37.50 per month, while the Cruze, at 25 mpg, should run you about $144.00 per month (assuming gas @ $4.00 per gallon). Based on these numbers, you will pay back the extra cost of the Volt in about 8.6 years. Not to many people keep their cars that long, plus I am not taking into account any maintenance costs. I can’t help but think the Volt is going to be more expensive to maintain than the Cruze due to its additional complexity. Rather than comparing the Volt with the Cruze, a better comparison might be the CT200h, a new hybrid from Lexus. The CT200h is a little cheaper, but only by a few thousand when you figure in the $7,500 government rebate for the Volt. The Ct200h is similarly sized and has many of the same features as the Volt. For me, if I was about to drop $32,000 on the CT200 hybrid, it’s a no-brainer. The Volt wins. It’s quieter, its acceleration is smoother and the front seats are more comfortable. The handling and braking seem about the same. The Volt and the CT200h also share some of the same negatives; small back seats, confusing dashboards and poor rearward visibility. The CT200h does have a windshield wiper on the hatch window which the Volt inexplicably lacks but the Volt comes with 3 years of OnStar free. So if you are considering buying a Volt, don’t do it to save money, don’t do it as an investment, do it because it’s fun to drive and for the thrill you’ll feel every time you pass a gas station and don’t have to stop. Buy it because you like driving something different and you enjoy having people you’ve never met ask you about your car. Or buy it because it’s good for the planet and you admire great technology. I’ve always believed cars are about more than transportation so the value of the Volt goes beyond dollars and cents. If you have any questions about the Volt, feel free to leave a reply. I try to answer questions within 36-hours, often sooner.